Make your voice heard in our second annual Reader's Choice Game of the Year competition, where 16 games go head to head, bracket-style, until only one game remains. We here at The Escapist love games. We love playing them, we love writing about them, and we love arguing about them. While there are still intense debates going on about what our Game of the Year might be, it's time for you, our lovely readers, to make your own voices heard on the topic. It's time for Reader's Choice Game of the Year 2014! We're happy to say that we've got some awfully fancy gaming gear for the best brackets this year from our partners at Roccat. Last year, The Escapist held its first Reader's Choice Game of the Year competition, and it was intense. Underdog and indie gem, Papers, Please tore through the competition for three consecutive rounds of voting, and nearly took down Naughty Dog's narrative-driven adventure, The Last of Us in the final round. It was incredibly close throughout the final round of voting, but The Last of Us eked out a win by a .17% margin at the last minute. The time has come once again for you to sound off on what you think should be Game of the Year. Sure, there were some awfully slow months, but there's been no shortage of amazing games in 2014, so we're anxious to see what The Escapist community thinks deserves recognition. Starting right about now, you'll be able to make your bracket predictions. The objective here is not to push your favorite game to the top spot, rather to guess what the community at large will vote for in each matchup. Everybody that fills out a bracket will earn a fancy new badge, but there are bonus badges available for the top three bracket scores, as well as anybody that guesses the ultimate winner correctly. Also, those prizes I mentioned earlier? Yeah, those are on the line, too. You'll need to fill out your bracket before 10am Eastern on December 2 to be in the running, so get to it! Once you've filled out your bracket, you'll have a few days to stew on your choices before voting begins for Round One at 12pm Eastern time on December 2. Once the voting begins for Round One, you'll have a week to make your case in the forums, recruit your friends to vote for your favorite games, and try to push your own picks into Round Two. Check out the full schedule below! December 9th - The 8 winners announced. Voting begins for the next 4 matchups. December 16th - The 4 winners announced. Voting begins for the next 2 matchups. 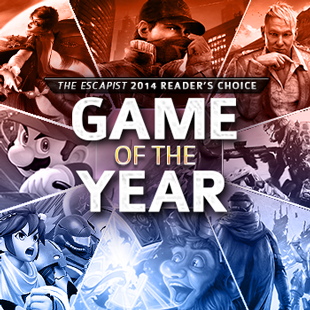 December 30th - The Escapist Reader's Choice Game of the Year 2014 announced! Click here to fill out your bracket. Note the tabs, which will take you to the Rules, How-to, Prize information, and more helpful pages!